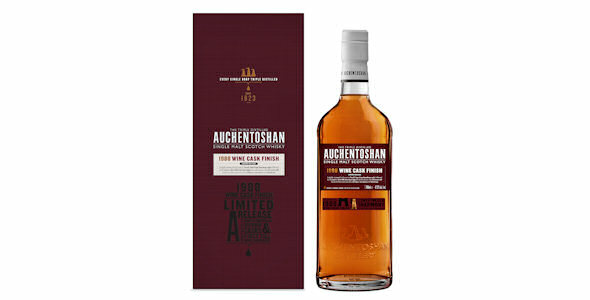 Auchentoshan, the only distillery in Scotland to continuously triple distil every single drop of its whisky, is proud to launch its exclusive limited edition 1988 Wine Cask Finish. This 25 year old limited release of 1,800 bottles brings together the best of American oak and French oak. It was initially matured for eight years in North American bourbon casks followed by an exceptionally long finish of 17 years in first fill wine barriques from Bordeaux, making it the longest Auchentoshan has ever been finished, and the longest wine finish in the industry. The lightness of Auchentoshan’s triple distilled spirit makes it perfectly suited to absorbing the qualities of the wine barriques, harmoniously resulting in an expression that is both sweet and rich. The liquid is a deep antique copper and takes influence from the exceptionally long finish in wine barriques with notes of sweet black cherries and grapey-wine tannins lingering to the end. The 1988 Wine Cask Finish has already been recongnised for its excellence in the industry, being awarded Silver Outstanding in the 2014 International Wine & Spirit Competition. The packaging had also received recognition with a nomination in the Scottish Creative Awards. Established in 1823, Auchentoshan triple distils every drop meaning the spirit produced reaches 81% ABV, significantly higher than most distilleries in Scotland. It is this delicate distillate paired with the carefully selected oak casks, that gives Auchentoshan an unmistakably light and fruity flavour. Auchentoshan’s inventive approach to Scottish whisky production has led the brand to embrace innovative ideas and processes such as maturing whisky in wine barriques. To the eye: Deep antique copper. To the nose: On the nose, cinnamon-spiced plums, sweet black cherries and chocolate cream. Beneath the sweetness is the subtle earthiness of ginger root, dried tobacco, cocoa and roast chestnut. To the tongue: The palate is supple and smooth with spicy oak tannins and a subtle chalkiness. Sweet cherries, plums skins and icing sugar develop with gently warming spices and burnt orange peel. To the end: Ripe cherries, stony minerals and rich grapey-wine tannins linger into the finish.